Two full weekends without getting into the hills! I don't think that has happened since I started hillwalking. Allison was otherwise occupied and so was I - many DIY projects - a bedroom painted, 5 rooms and a hall sanded and varnished, garage gutted, basement tidied, shelves made, many other things. Including a full day in the garden on Tuesday in full sunshine without a shirt - leading to major sunburn on my back. 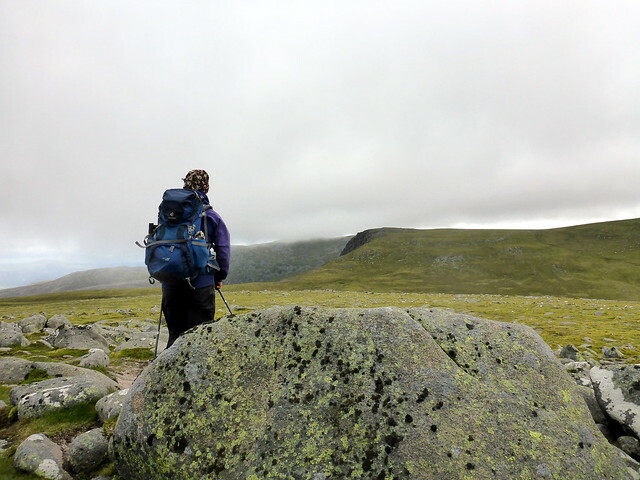 Try lugging a big rucksack with a sun-smarting back - no fun Anyway it was time to get out into the hills again - the weather seemed to suggest east was better, though I wished for Skye or Assynt - so I reckoned we could do the dozen Tops around Lochnagar with a couple of overnight camps which would allow the addition of the Munros and a couple of SIMMs, then maybe the 3 outstanding Tops Allison has around Glas Maol before heading down to the Ochils to complete her Donald round on the Sunday. We drove up Braemar way on Thursday late afternoon, arriving at the parking spot at Glen Callater around 7.30. We ate our tea in the car and got packed up - plan was to walk in and climb a couple of Simms - Meall an t-Slugain and Creag an Loch before finding a suitable place to pitch for the night. I had thought about the bothy, but that wouldn't be compatible with the Simms. Along the track by the Callater Burn for 3km to the footbridge then up the hillside on our left - heather, some moths around. 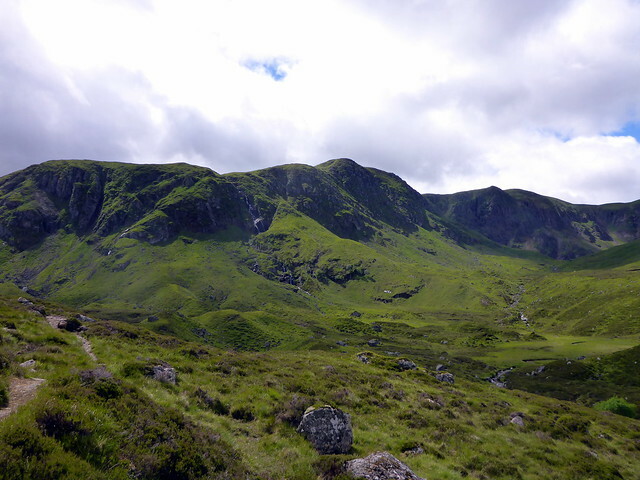 Onto Creag Phadrug then to the spine of the two Simms. Loch Callater gleamed silver in the gloaming. 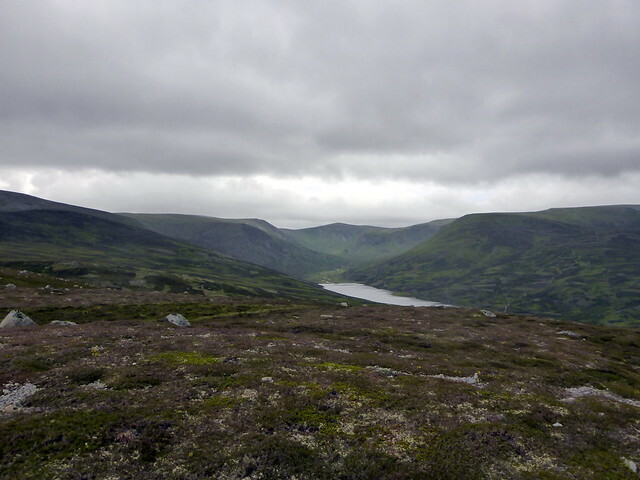 Descending from Creag an Loch we pitched beside a wee loch, lots of deer prints in the peat. Being around the longest day it didn't really get dark at all - however the wind, which had been a moderate breeze when we pitched soon became much much stronger. 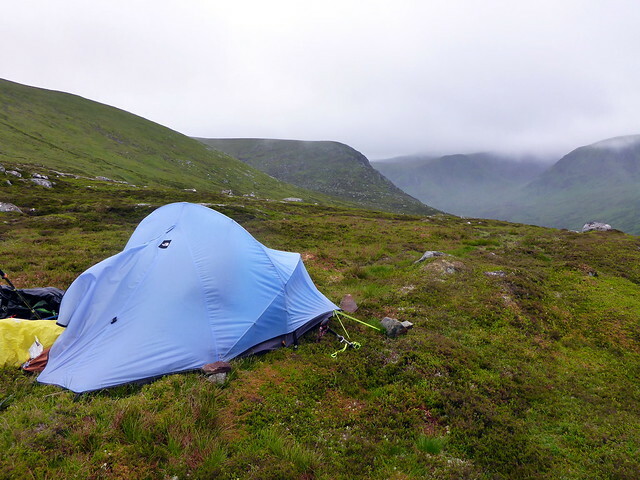 The tent flapped and bucked and around 02.30 the tent pegs started coming out the ground, necessitating an urgent quest for rocks to weight the guylines down - fortunately there were some not too far afield and the rain had temporarily halted whilst I sought them. Not a wink of sleep was had by either of us however. 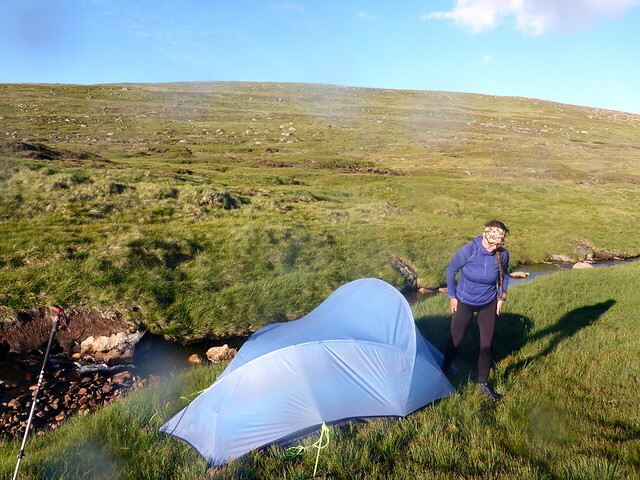 Wee Blue is not the best tent in high winds, although I was happy I hadn't carried out my original plan of taking our tiny cuben fibre tent which would not have withstood the winds that night. Morning - rain stayed with us til after 8am - the forecast had suggested dry after 6am. It was therefore a slow and rather sluggish start to what was going to be a long day. 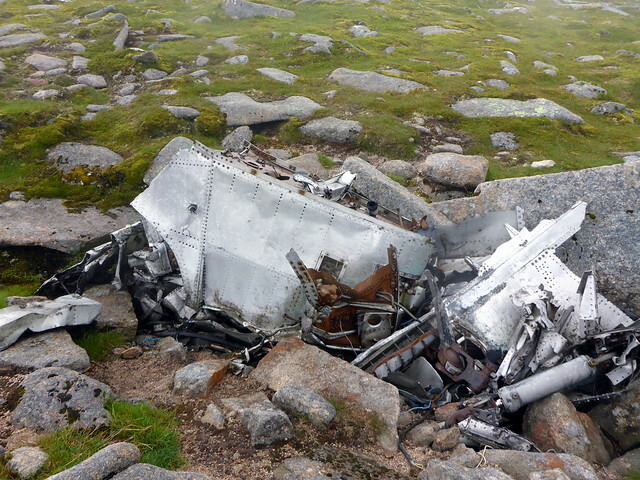 We didn't get started til just after 9am, joining the track up Carn an t-Sagairt Mor, passing assorted aircraft debris from the Canberra crash, November 1956. 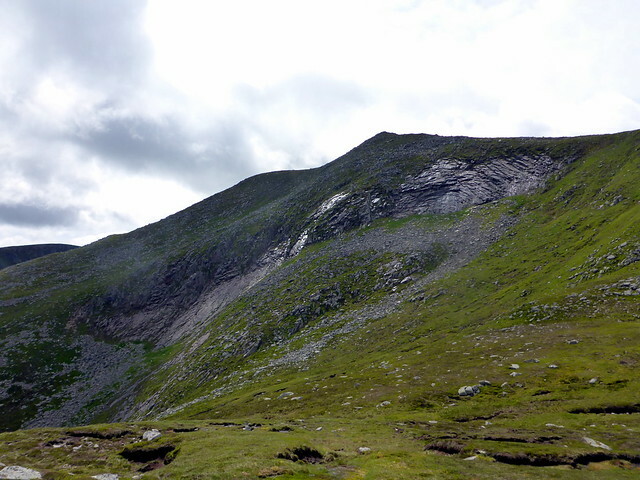 On to Carn an t-Sagairt Beag, our first Top of the day. When I did this circuit previously I headed off down to Coire Lochan nan Eun to climb Meall Coire nan Saobhaidhe - this involved an unpleasant boulder field crossing so for this time round I had us come off to The Stuic and round to the summit of Lochnagar, before heading down the NW spur of Carn Cac Beag. 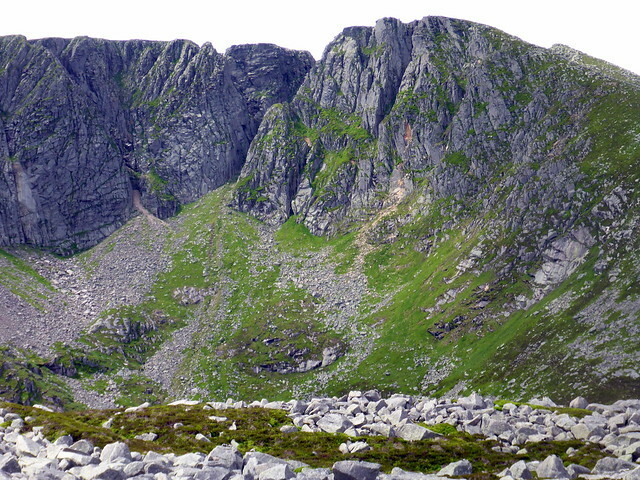 This option reveals impressive silvery crags to the north side of Lochnagar, although the descent is steep. 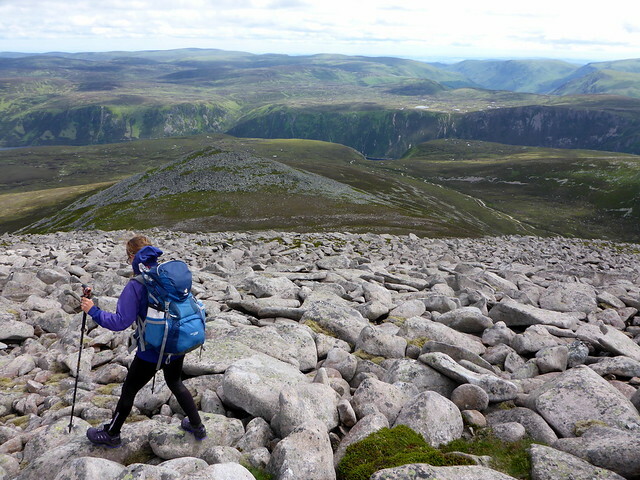 We paused for lunch before ascending Saobhaidhe then contoured around Lochnagar towards Meikle Pap, an enjoyable scramble over huge boulders. 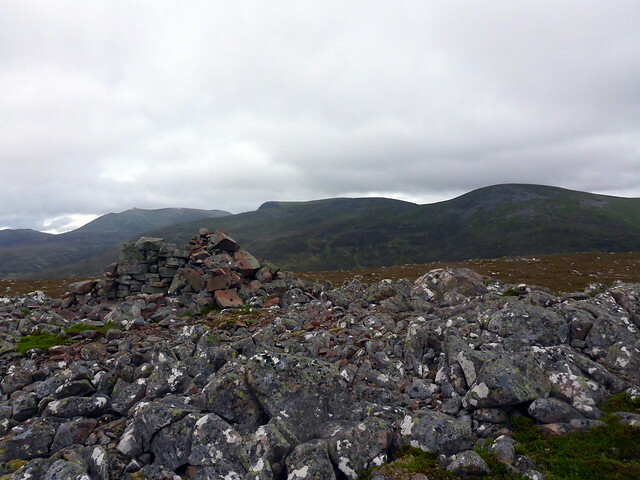 After Meikle Pap we took the usual track from Fox Cairn Well and continued SE to Cuidhe Crom. There's a considerable descent over more boulders to reach Little Pap - it's easy to forget you are almost at 1100m up here. 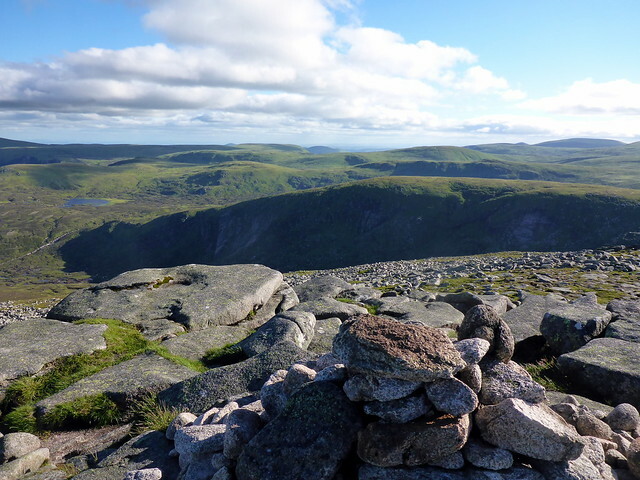 From Little Pap there's a somewhat arduous contour above the track that leads to Loch Muick before crossing that track and continuing on to the unremarkable bump of Creag a'Ghlas Uillt and the even less impressive Eagles Rock. 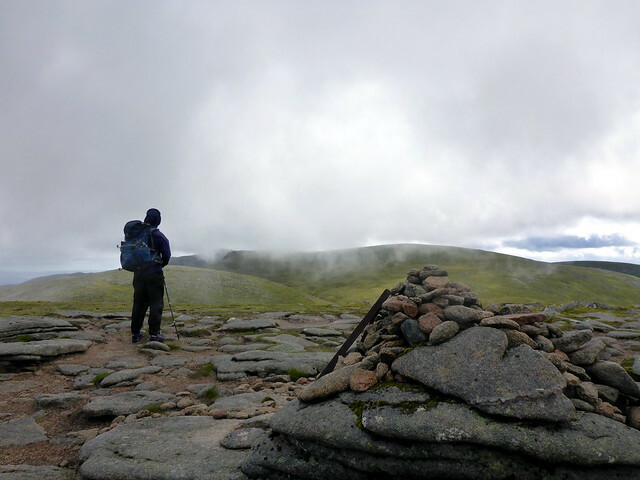 Onwards to Carn a'Choire Bhoidheach - that's 3 Munros and 7 Munro Tops so far. 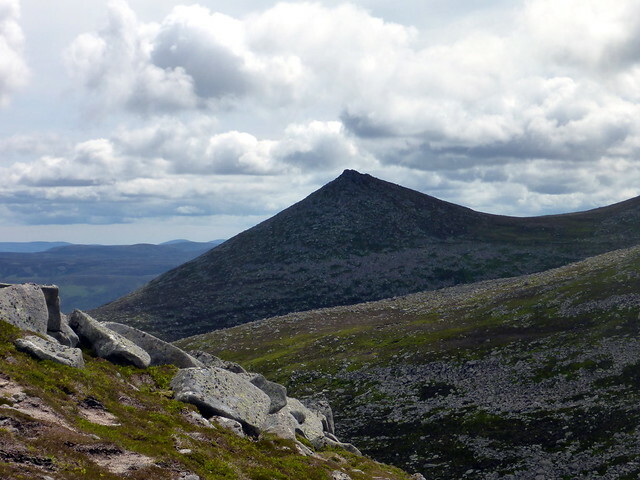 We rejoin the track that leads past Carn an t-Sagairt Mor then heads to Cairn Bannoch, taking in Fafernie en route. It's getting on a bit by this time - we reached Fafernie at 5.30pm and i can tell Allison's getting tired. We are on a plateau here at over 1000m and the westernly wind is still blasting us at every opportunity. 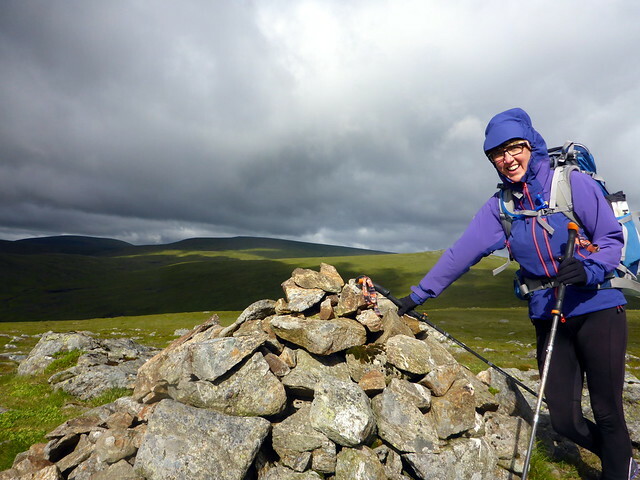 We press on to Cairn of Gowal and then to Creag an Dubh-Loch. 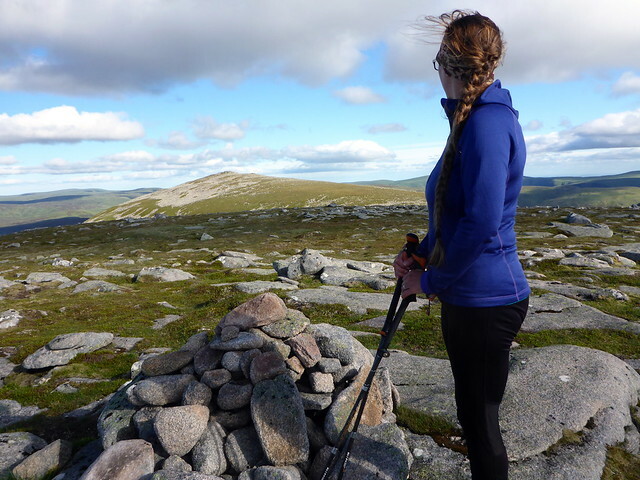 There are a number of large boulders scattered around and we look in vain for a sheltered spot behind one of them - but they are either in the wrong direction to shield the wind or the ground in their lee is too rocky to be serviceable. 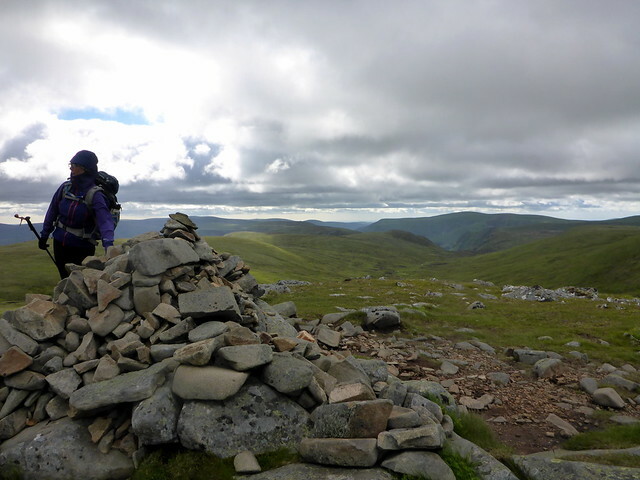 We drop our packs and head for Broad Cairn then return over the old top of Cairn of Gowal. I'm hopeful that we'll find something in the valley between Craig of Gowal and Crow Craigies, although I remembered this being boggy last time. 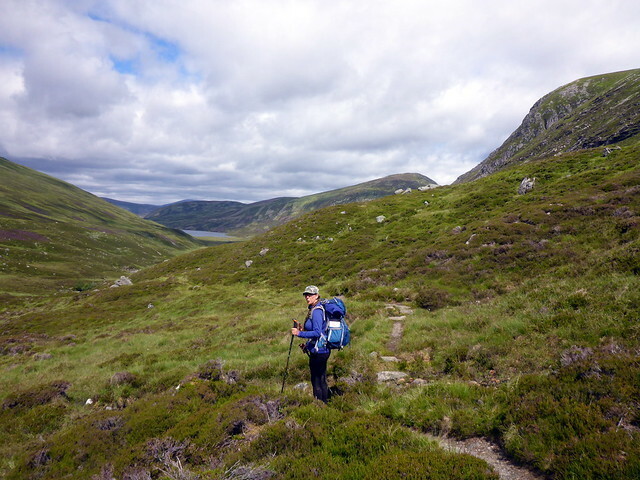 We surmount Cairn of Gowal and head down into the valley, looking for a suitable place by the burn - after some searching we find a spot that is both dry and reasonably sheltered - result!. It's nearing 8pm by this point - our tea is long overdue. A pleasant night with the burn burbling away beside our tent and minimal disturbance from the wind. Rain makes a brief appearance at some point but it is a sunnymorning, warm rays coming into the tent. We breakfast and prepare to make the final Munro Top of Crow Craigies. I had tagged Tolmount and Tom Buidhe onto this round as we were so close to them- a mere 5km deviation to pick up 2 Munros. We met an elderly German Munro bagging couple at the top of Tolmount. 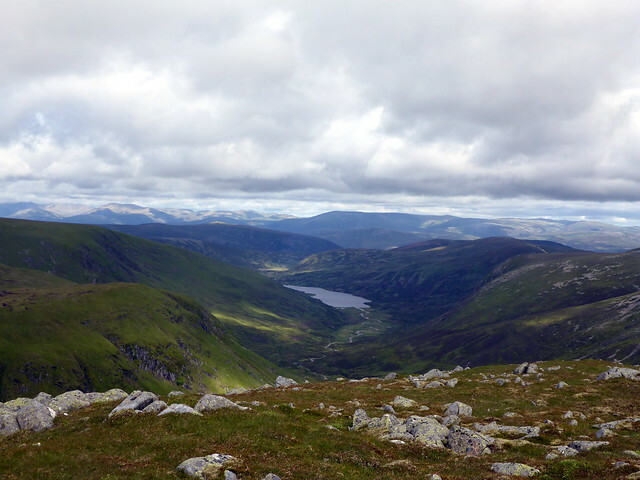 From here we descended towards the Knaps of Fafernie before joining Jocks Road back along Glen Callater. The start of this "road" is a bit difficult to find, but it becomes more apparent as one descends. 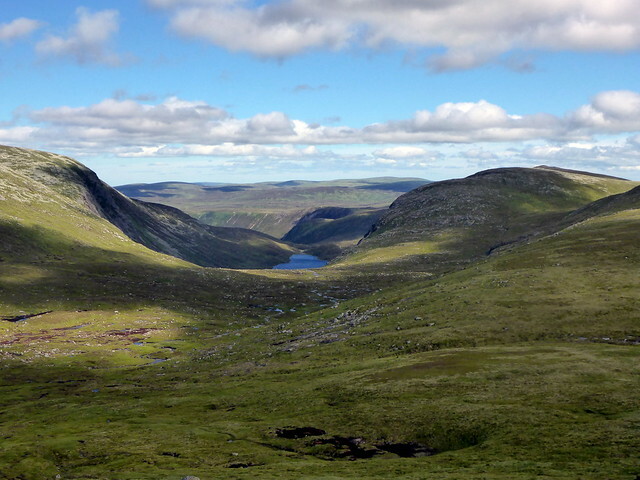 Glen Callater was lovely, some superb waterfalls coming from the back of Carn an Tuirc. Tolmount looks impressive from this aspect. 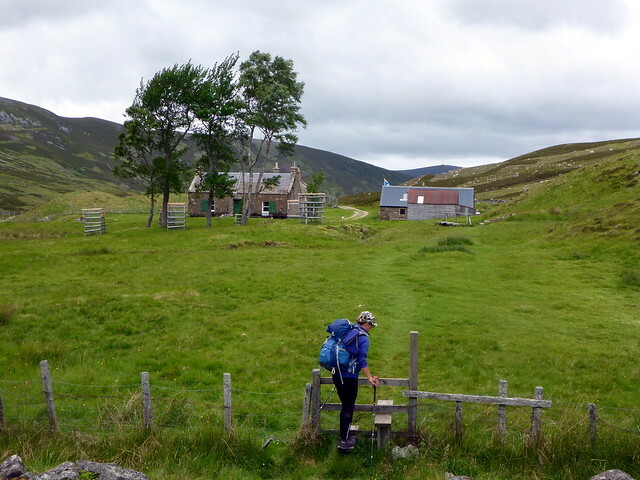 We continued along the northern shore of Loch Callater, passing the bothy which seemed busy, with folk arriving in a couple of land rovers then marched back along the track to the car. It was perhaps 2pm by this time. 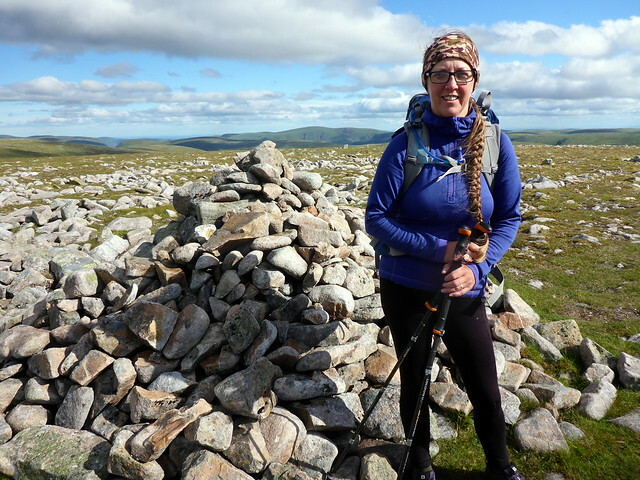 I didn't think it was worth pushing for the 3 other Tops around Glas Maol today - Allison looked in pain and the weather looked uncertain. We mulled over the options before deciding on heading to Braemar to camp and to do one of the short Marilyns near Braemar in the early evening. However the campsite was full. Instead we decided to head down towards the Ochils for tomorrow's Donald Completion, stopping at the Co-Op in Blairgowrie for a couple of essential provisions (pie being one of them - a lattice strawberry & rhubarb in this case). 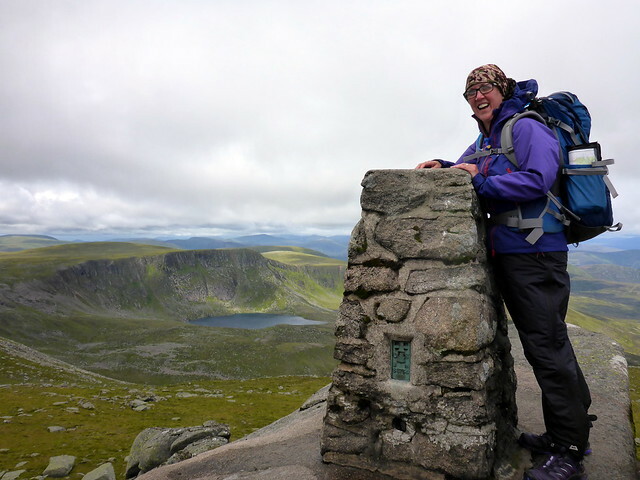 Funny, we visited Lochnagar on Saturday the 17th, just a few days before you Just a day trip, the summit was a windblown, cloudy place, we could hardly stand up! 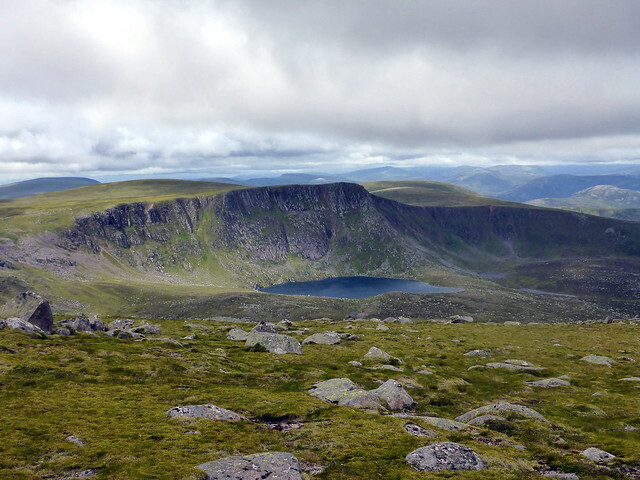 To vary the route, we descended over Cuidhe Crom to the col with Little Pap. That boulderfield was a nightmare, especially that Kevin has a slight knee injury... 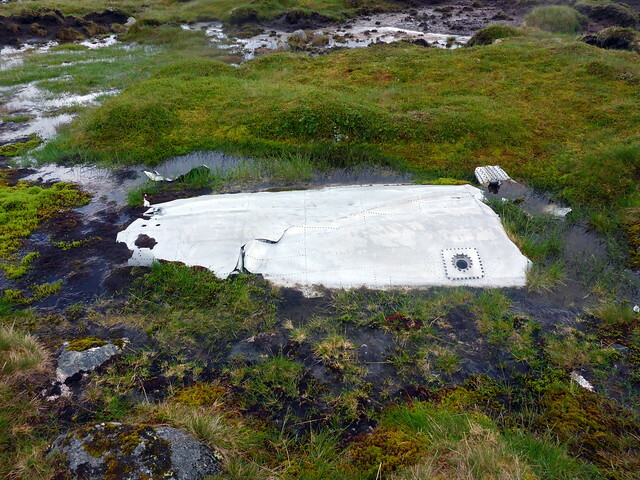 But we found another plane wreck, this one a Firefly that crashed in 1949. It's just below the col Cuidhe Crom-Little Pap col. The original impact "crater" still visible. Spooky There are bits of wings, undercarriage, even a burnt battery. Will post more details with my report later... when I get around to writing it eventually! That looks like a fine route through some grand country. And some cracking pics: the pano 1160107 looks positively surreal! I need to work out a route around here, and this report certainly ups the desire to get into these hills. 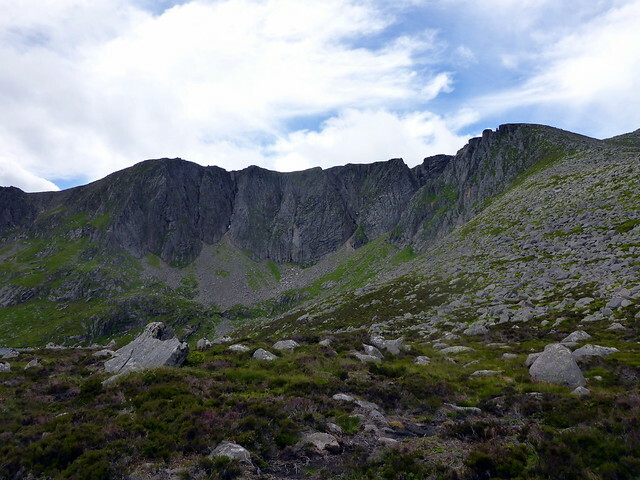 I was also in this area last week (the night of 21st and day of 22nd), though for a much more modest route to pick up the four Lochnagar / White Mounth Tops that I had not visited when walking the usual circuit a few years before. 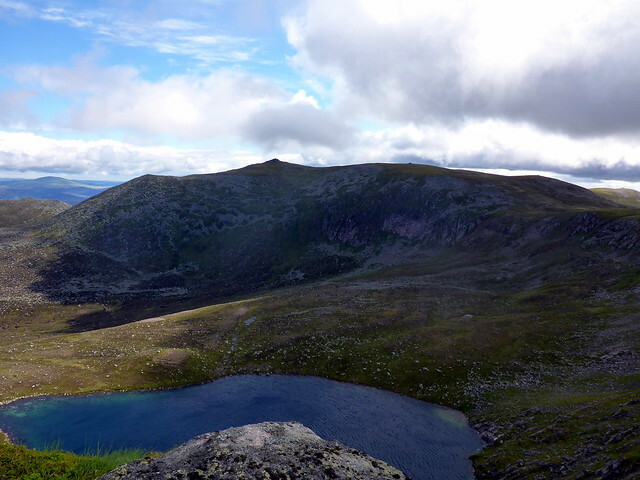 It seems to be the outlying Tops, especially the Paps and Meall Coire na Saobhaidhe, that stand out more than most of the plateau, including the four lower Munros. I confess to originally missing a couple, Creag a Ghlas-Uilt and Eagles, because a glance at the map and look at the hills themselves had me convinced they couldn't possibly be Tops, or anything else worth mentioning. 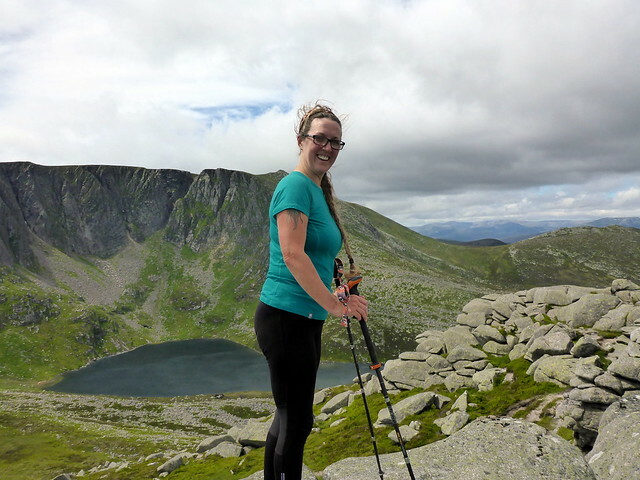 Those views from Lochnagar to The Stuic and back look good. I'd managed to work that into my route, since I had a lighter pack, finding it a fine easy scramble and great viewpoint for several directions.